India’s first Android one Hindi smartphone was launched by spice on Wednesday named Spice Dream Uno H, company partnered with Google and launched this phone at a price of Rs 6,499. The phone comes with a 4.5 inch display and powered by 1.3 Ghz quad core processor along with dual sim slot, 5MP primary and 2 MP secondary camera and comes with android 4.4.4 kitkat o.s. The phone will also feature a hindi keyboard and voice input for hindi versions of popular google products. 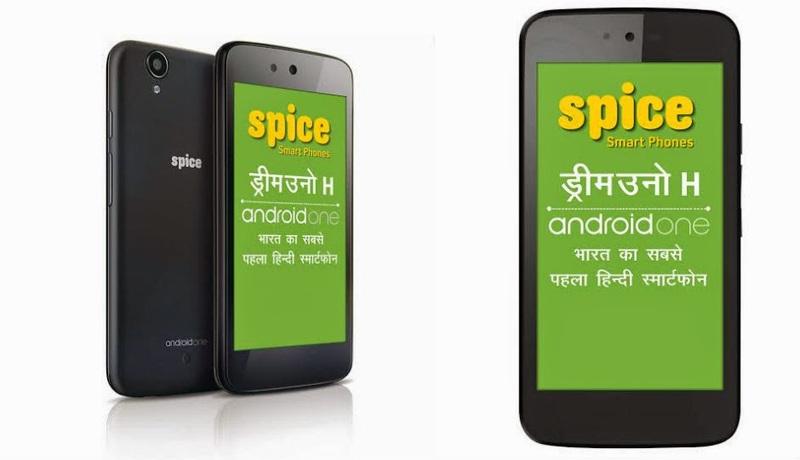 Spice stated that this Android One phone is especially designed for the 300 million hindi speaking people. Spice Mobility chief executive Mr. Prashant Bindal said “we believe that this phone will contribute immensely on connecting 300 million hindi speaking masses to the internet with useful applications such as Google search, YouTube and Google maps”. Caear Sengupta, VP, Product at Google India also said that they are very excited by the launch of second Spice Android One phone which targets Hindi users. The company targeted this phone mostly to the people living in states Uttar Pradesh, Madhya Pradesh, Haryana, Rajasthan, Bihar. By launching this phone the company aims to connect more people with them and this phone will surely attract the attention of hindi speaking people in rural and urban areas.